Fred Keeley, three-term member of the California State Assembly and recently retired treasurer of Santa Cruz County, moderated a panel on "Climate Change Science and Policy in a President Trump Administration." 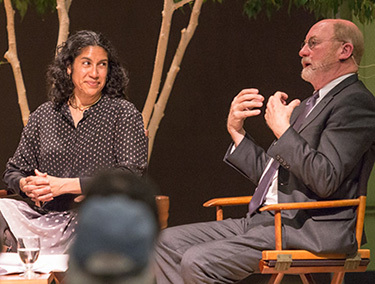 Panelists included Erika Zavaleta, professor of ecology and evolutionary biology, and John Laird, secretary of the California Natural Resources Agency. Paul Koch, dean of physical and biological sciences, joined Ramanathan to take questions from the audience after the keynote. Scientists agree that human activities are changing Earth's climate and that the consequences for humanity could be dire. Experts also believe currently available technologies can provide solutions to the problems of climate change. Implementing the transition to sustainable energy technologies won't be easy, however, and the need for action is urgent, according to the scientists and policymakers gathered at the fourth annual UC Santa Cruz Climate Conference, held on campus February 24-25. "Acting now to secure a sustainable future" was the theme of the conference. The obstacles presented by the new administration in Washington, D.C., which is skeptical of climate science and opposed to policies aimed at mitigating climate change, cast a shadow over the conference and were the focus of the final panel, presented as the Fred Keeley Lecture on Environmental Policy. Despite shifting U.S. policy, however, many speakers expressed optimism about the potential to continue making progress in efforts to reduce emissions of carbon dioxide and other greenhouse gases that trap heat in the atmosphere. "California is staying the course. It's not game over, it's game on," said Emily Wimberger, chief economist at the California Air Resources Board. 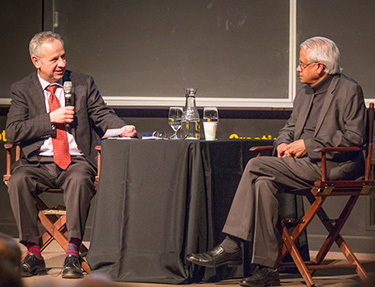 In his keynote address, climate scientist Veerabhadran Ramanathan made the case that climate change now poses an existential threat to our civilization. "Climate change can reach crisis levels in this century, affecting rich and poor alike," he said. "It is an urgent problem and requires urgent solutions." Ramanathan, a professor of atmospheric and climate sciences at UC San Diego, predicted in 1980 that global warming would be detected by 2000. Looking at current projections, he said, the amount of global warming by 2100 could be catastrophic. Catastrophic for whom? "Everyone will feel the change," he said. "If half the planet is going to be displaced, that will affect us all." The point of the conference, however, was not to dwell on the threats, but to bring together leading experts to discuss what can be done now to change the outcome, said Paul Koch, dean of physical and biological sciences. The conference was jointly sponsored by the divisions of Physical and Biological Sciences and Social Sciences. The first panel, moderated by UCSC physics professor Sue Carter, focused on technological solutions. Energy efficiency has been called the "low-hanging fruit" for reducing greenhouse gas emissions, because it is relatively easy to implement. According to David Auston of the Institute for Energy Efficiency at UC Santa Barbara, however, "some of that fruit is still rotting on the vine." The Department of Energy estimates that one-third of all the energy used in the United States is unnecessarily wasted. A major impediment for energy efficiency is that the cost is almost always all up front, so there is a tendency to defer implementation, even though it saves money in the long run, Auston said. For new buildings, he said, it's important to shift the focus from up-front costs to life-cycle costs, and he has been working on recommendations for UC to take that approach for new construction. "It is important for UC to set a model for the rest of the world," Auston said. "We have an obligation to be a living laboratory and share what we learn with others." In a panel on motivating change, venture capitalist Derek Proudian noted that the savings available from energy efficiency is already driving adoption of new technologies. He served as CEO of Daintree Networks, a company recently acquired by General Electric that retrofits buildings with smart technology for energy efficiency. "Preaching about climate change won't affect behavior as much as a good return on investment, and there is money to be made in using information technology to improve efficiency," Proudian said. "That trajectory is going to continue, so that's one reason to have optimism." The transition from fossil fuels to sustainable energy sources will be more difficult. But several panelists maintained that currently available renewable energy technologies are sufficient to meet our energy needs. "It is technically and economically possible to power the country with 100 percent clean, renewable energy sources," said Mark Jacobson, who directs the Atmosphere/Energy Program at Stanford University. Daniel Shugar, CEO of solar energy company NEXTracker, overflowed with enthusiasm as he described the rapid growth of solar energy and the potential for solar technologies to provide increasing amounts of clean, renewable energy. Yet fossil fuels still account for 63 percent of U.S. power production, and the proportion is higher worldwide, noted power industry consultant Peter Cartwright. "There are real challenges as the industry tries to provide more power for more people and at the same time reduce greenhouse gas emissions," he said. Switching from coal to natural gas can help, because the greenhouse gas emissions are about 50 percent less from natural gas. But converting coal-fired power plants to natural gas requires a big investment, and the plant then continues burning fossil fuels for decades into the future. Cartwright quipped that natural gas has been called "the methadone of fossil fuels" — less dangerous but just as addictive as coal. A panel moderated by Rob Irion, director emeritus of the UCSC Science Communication Program, focused on the communications challenges posed by the prevalence of climate change denial in the United States. Laura Helmuth, science editor for the Washington Post, outlined the factors that make it hard to explain climate change to the public: climate change is complicated, it's invisible, it's a long-term process, and there is a well-organized campaign to spread disinformation about it. Susan Hassol, a climate communication specialist, said overcoming the partisan gap on climate change requires focusing on shared values. "People are motivated by other reasons, such as jobs and clean air. There are real economic and health benefits of making the transition to clean energy," she said. 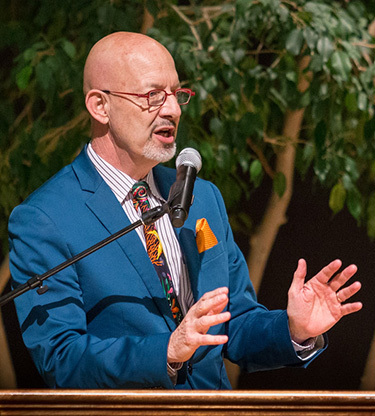 Edward Maibach, who directs the Center for Climate Change Communication at George Mason University, emphasized the importance of simple, clear messages, repeated often. "The human mind doesn't deal well with complexity," he said. "The less we say, the more we're heard." In response to a question about scientists planning a "march for science" in Washington, D.C., the panelists expressed unanimous support for the idea. "Public demonstrations do have an effect on politicians," Maibach said. 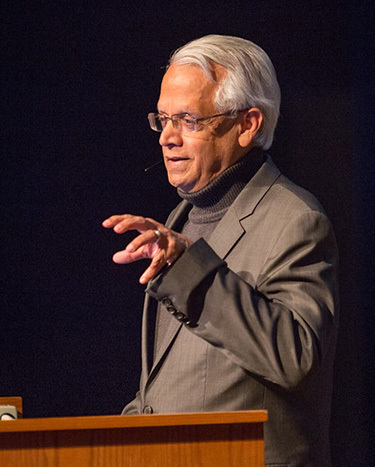 Ramanathan, meanwhile, is working with other UC scientists, including Carter and environmental studies professor Daniel Press at UCSC, to develop a climate solutions course for undergraduates to be offered in fall 2017 at all ten campuses. "We want to create a million climate warriors," he said. "Let us bend the curve on climate change before it's too late."